Tensions in American society over religious and scientific accounts of human origins are centuries old, and the divide between the two contending worldviews continues today as part of an escalating political conflict over science education. As readers of Geotimes are well aware, at the local, state and national level, religiously motivated activists are working to change curriculum standards to allow for divine accounts of human origins. This fall, the ongoing political struggle will be catapulted into the wider public eye once again as the news media homes in on Dover, Pa. There, the school board decision to include alternatives to evolution as part of the districts official science curriculum is being challenged in federal court, and the citizens of Dover are preparing to go to the polls in a referendum on the issue. Dover will not be the only evolution hotspot, as other communities and states around the country, including Georgia and Kansas (see sidebar, below), continue debates over teaching evolution in public schools. Spearheading the efforts to amend how evolution is taught is the intelligent design (ID) movement. Savvier and more politically sophisticated than traditional Young Earth creationists, the ID movement targets the public. Via books, magazine articles, videos, public speeches, direct mail campaigns, Web sites and media appearances, the ID movement seeks to mold public opinion, building political pressure on elected officials to amend science education standards to include ID as an alternative to Darwinian evolution. Given the importance of public opinion to the ID debate, we recently analyzed existing poll findings specific to public understanding, beliefs, policy preferences and information sources related to evolution. We interpreted results from several national news organization surveys, as well as a nationally representative public opinion study we conducted in the spring of this year. In examining poll trends, we considered results with reliability and validity in mind. Given variations in question wording, we can be more confident about where the public stands if there is some consistency in poll findings. In terms of validity, scrutinizing the language of the polls, along with other indicators, allowed for a better idea of whether the poll items are actually reflecting true opinion when it comes to the debate. In our national survey, we first asked respondents to rate on a scale from one to 10, where one is little attention and 10 is very close attention, how attentive they were to newspaper and TV news coverage of a number of contemporary issues, including the debate over teaching alternatives to evolution. 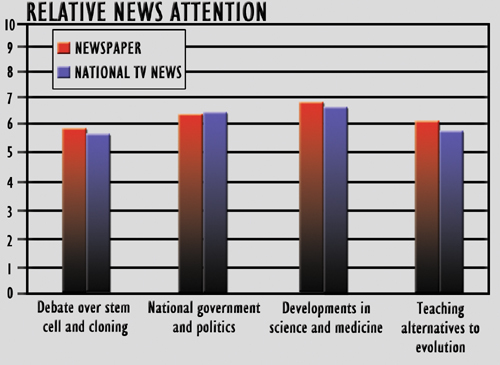 Across TV and newspaper coverage, the data indicate that Americans pay comparably close attention to the issue of evolution relative to other issues, such as the debate over stem cell research and national politics. In a recent national survey, respondents were asked to rate on a scale from one to 10, where one is little attention and 10 is very close attention, how attentive they were to newspaper and TV news coverage of the issues displayed in the graph. 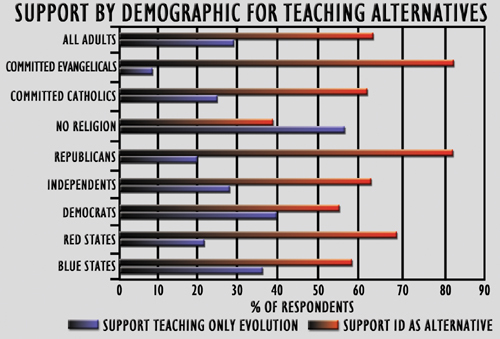 In comparison to other major political topics, those surveyed pay relatively close attention to the debate on teaching alternatives to evolution. Source for all data figures in story: Nationally representative random-digit-dial telephone survey, conducted March 19 to April 29, 2005, by the Survey Research Institute at Cornell University, interviewing 774 adults age 18 and older. The margin of error for the survey is +/-3.5 percent at the 95 percent confidence level. Principal investigator is Matthew C. Nisbet of the School of Communication at the Ohio State University. Given the grassroots organizational activities of ID proponents, we were also interested in measuring how much information respondents were receiving about the issue outside of mainstream news coverage. Information and frequency of contacts through direct channels were surprisingly low, with only 4.9 percent of respondents reporting that in the last two years, they had been contacted about the issue by mail or phone; 9.1 percent reporting they had been encouraged in church to take a position on the issue; 7.4 percent reporting they had received relevant information or materials in church; and only 11.3 percent indicating they had received an email or saw information online about the matter. Moving from public information sources about the debate to estimates of public knowledge, the various poll findings are fairly consistent in showing that many members of the public underestimate the overwhelming scientific consensus in support of the theory of evolution, and that nearly equal numbers are confused about the scientific credibility of intelligent design. For example, in a November 2004 Gallup poll, respondents were asked: Just your opinion, do you think that Charles Darwins theory of evolution is: a scientific theory that has been well-supported by evidence, or just one of many theories and one that has not been well-supported by evidence, or dont you know enough to say? Only 35 percent of Americans indicated Darwinian evolution as a scientific theory supported by evidence, whereas 35 percent indicated that evolution was just one among many theories, and 29 percent answered they didnt know. A similar result was found when the Gallup Organization asked the same question in February 2001. In our national survey, employing two separate questions, we asked the public to agree or disagree that the theory of evolution, and then alternatively the concept of ID, is based on an overwhelming body of scientific evidence, which strongly confirms that its key ideas are correct. Only a bare majority of adult Americans (56.3 percent) agreed that an overwhelming body of scientific evidence supports evolution, while a very sizeable proportion (44.2 percent) thought precisely the same thing about ID. If significant proportions of the public are either confused about intelligent design or refuse to accept the science in support of evolution, where does the public stand in terms of their beliefs about human origins? Across several surveys, Gallup has measured the publics beliefs specific to the view that humans developed over millions of years with no role played by God, the theistic evolutionist view that humans developed over millions of years with God guiding the process, or the creationist view that God created humans pretty much in their present form at some time in the last 10,000 years. When Gallup first asked the public in 1982 about their views on the matter, 38 percent indicated they believed in the creationist explanation, 33 percent believed in the theistic evolutionist explanation, and 9 percent chose the no God account. Beliefs changed slightly over the next 10 years, trending toward the creationist explanation. In a 1991 Gallup poll, 47 percent chose the creationist explanation, compared to 40 percent for the theistic view, and 9 percent for the no God account. Gallup administered the question again in November 2004, showing beliefs changed little, as 45 percent chose the creationist explanation, 38 percent the theistic evolutionist account, and 13 percent the no God explanation. A December 2004 Newsweek poll replicates the most recent Gallup result within the margin of error. A public divided on the role of God in evolution would not be surprising, given that a 1997 survey of U.S. scientists finds that only 55 percent subscribe to the idea that humans developed with no role played by God, compared to 40 percent who agree with the theistic evolutionist account. What is surprising, however, is the increase over the past two decades in public support for the creationist viewpoint, with Young Earth creationist beliefs reaching near-majority levels. Although it might be difficult for some scientists to imagine even posing the question, polls indicate that when queried generally about the possibility of teaching creationism instead of evolutionary theory, only a slight majority of the public opposes such a move. If asked generally about teaching both creationism and evolutionary theory in public schools, the public is also remarkably consistent in favoring both. A December 2004 Newsweek survey asked, Do you favor or oppose teaching creation science instead of evolution in public schools? Forty-four percent said they opposed teaching creationism instead of evolution, compared to 40 percent who favored the move, and 16 percent who said they didnt know. A November 2004 CBS News poll measured slight majority opposition to teaching creationism instead of evolution (51 percent), with 37 percent favoring the proposal, and 12 percent saying they didnt know. A similar majority finding was produced in a 1999 Gallup poll. In the same December 2004 Newsweek poll, respondents were asked, In general do you favor or oppose teaching creation science in addition to evolution in public schools? Sixty percent favored the idea, 28 percent opposed it, and 12 percent were undecided. The November 2004 CBS News poll found a similar result, with 65 percent favoring, 29 percent opposed, and 6 percent undecided. Going back to 1981, the available polling record indicates that across question wording, a majority or near majority of the public favors teaching creationism in addition to evolutionary theory in public schools. In our spring 2005 survey, in place of the traditional term creation science, we wanted to tap directly into respondents views about teaching ID as an alternative to evolution. Despite changing the label, the findings are essentially similar to past poll trends, with more than 60 percent favoring teaching ID as an alternative view. These views vary substantially across specific demographic groups, with the greatest support for ID emanating from committed evangelical Christians. These poll findings should be troubling to scientists and educators, but the question remains, what forces shape public beliefs and preferences? The answer is complicated and the topic deserves further study, but based on what we know about public opinion processes generally, a few intertwined influences are likely at work. First, we can think about public judgments as the interaction between the basic values that citizens bring to the issue and the types of media messages and images that are most readily available about evolution and ID. In a national survey conducted this year (see figure above), 774 adults were asked: Do you agree or disagree that the theory of evolution/concept of intelligent design is based on an overwhelming body of scientific evidence, which strongly confirms that its key ideas are correct? The results, shown in the table, show that many members of the public underestimate the scientific evidence in support of evolution, and overestimate the evidence supporting intelligent design. Specific to evolution, many competing arguments appear regularly in the news. On an everyday basis, science coverage about the latest fossil find or scientific discovery rarely challenges the basic assumptions of evolution. But when the topic shifts from the everyday domain of the science pages to coverage of the highly politicized contexts of school boards, trials and legislatures, the ID movement has been very successful at injecting into coverage their strategic interpretations and definitions. Many journalists compound the problem by carefully, yet erroneously, balancing pro-evolution against ID arguments, inevitably leading to a confusing picture about the state of the science. For other Americans, however, support for teaching alternatives to evolution stems in part from a lack of appreciation for the strong scientific consensus backing evolutionary theory. To use an analogy from election campaigns, these citizens are the swing vote or persuadables in the communication battle over evolution. Their lack of understanding connects to a well-intentioned, but, in this case, misguided sense of democratic pluralism: no specific belief, no matter how scientific, can be the complete answer, and therefore all beliefs should be included and respected. Emerging from these orientations is a populist view that teaching both evolution and ID makes sense. Low-information pluralists believe rightly that students should be exposed to multiple points of view, and be allowed to make up their own minds. However, in this particular case, where they are misguided is in believing that ID passes both the scientific and the legal standards necessary to allow inclusion in science textbooks and teaching standards. If these citizens accept ID as being scientifically legitimate, then it is easier for them to additionally accept the paired argument from ID supporters that the issue is fundamentally about enabling local control of education and about respecting a diversity of beliefs. When national protest erupted in reaction to the 1999 Kansas decision to delete evolution from the state science standards, the state became the subject of jokes on late-night TV and in political cartoons across the country. A strong majority of Americans in subsequent polls registered their opposition to the move. For example, a survey by the People for the American Way asked respondents, The Kansas State Board of Education has recently voted to delete evolution from their new state science standards. Do you support or oppose this decision? Sixty percent of sampled adults nationally opposed the move compared to 28 percent in support, with 12 percent unsure. A 1999 Fox News survey found similar results, with 57 percent of registered voters nationally disagreeing with the decision, 33 percent agreeing, and 10 percent not sure. In addition to framing strategy, public engagement efforts should be interactive, and move beyond just one-way efforts at media campaigning. Organized deliberative forums such as local town meetings that bring citizens into direct contact with scientists, educators and other community members can help facilitate moderation, trust and understanding on the part of both sides in the debate. Following an intense and widely publicized debate, the Kansas State Board of Education plans to release the final version of a revised science curriculum for public schools this fall. Their recommendations are expected to decentralize evolution in science education and promote scientifically untested ideas as possible alternatives. Hearings to discuss the changes were held earlier this May, exposing the polarization between supporters who testified and scientists who boycotted the event  and the friction is not likely to end any time soon. The science curriculum in Kansas public schools has been in flux since 1999, when the Kansas State Board of Education voted to remove macroevolution and Big Bang cosmology from the education standards, an act denounced by the scientific community. Two years later, the vote was overturned, and the subjects returned to classrooms. But following the November 2004 elections, members of the board once again took aim at the science curriculum and created a committee to alter the standards. Intelligent-design (ID) advocates do not adhere to the literal interpretation of biblical creation; rather, they believe the complexity of life is evidence that something intelligent must have designed it  a philosophical idea that many scientists think should not be discussed side by side with the scientific theory of evolution. The revisions authors propose, along with the emphasis that evolution is a theory and not fact, to literally change the definition of science. The phrase seeking natural explanations would be removed to accommodate the possibility of nonmaterial explanations, including that of an intelligent designer. There are several revisions being contemplated, says Steve Abrams, chairman of the Kansas board of education. In addition to evolution, Abrams says the board has asked the committee to rework standards for physiology, zoology, botany and microbiology curriculums. According to Abrams, the purpose of the May hearings was to inform the public about the debate and also to provide testimony for the revisions to the most recent draft. It also gave ID proponents a chance to weigh in on changes proposed in the boards so-called minority report. I was encouraged to have as many credentialed scientists make presentations for the minority report as we did, Abrams says. John Calvert, who has a bachelors degree in geology and acts as the managing director of Intelligent Design Network, a nonprofit advocacy group, presented data at the hearing that indicates that most of those in favor of the minority report are calling for a critical analysis of evolution and the teaching of all sides. Others disagree that teaching all sides is the best approach. In science, it is critical that we separate and know that religion is not science and science is not religion, Irigonegaray says. Miller chose not to attend the hearing, although he was invited by a member of the National Science Teachers Association to present a mainstream view of science. Although he says that he was honored, he joined the boycott and turned down the offer. When deciding whether or not to testify at the hearing, Miller says, a few things struck me as strange about the situation. First, he says, thousands of people in Kansas could have presented his same view. Second, Miller submitted a position statement available online. You already have my opinion, Miller says he told the board. You dont need to fly me to Topeka, Kansas. Finally, Miller says that he became concerned when discovering three of the six members of the board  all on record as supporting creationism  organized the additional May hearings. The final straw was when I realized who was going to attend, Miller says. Miller was not alone in the boycott. Many scientists declined to participate on the grounds that merely engaging the ID movement would validate it as a viable scientific theory. But despite the boycott of the hearing itself, scientists had a public presence. Irigonegaray says that they joined together with the goal to raise awareness of the evolution opposition. My concern is that what we saw in Kansas is the tip of the iceberg of what I perceive to be a movement to interject faith into science, Irigonegaray says. Science teachers across America should be very cognizant of the fact that this movement has significant strength and is well-financed. The May hearings cost taxpayers about $17,000 according to the National Center for Science Education. Matthew C. Nisbet, Ph.D., is an assistant professor in the School of Communication at the Ohio State University, where his research focuses on the intersections between science, media and politics. Erik C. Nisbet is a senior research associate at the Survey Research Institute at Cornell University and a doctoral student in the Department of Communication at Cornell.